The problem is, very few if any of these diets can compare to a natural, home made diet. 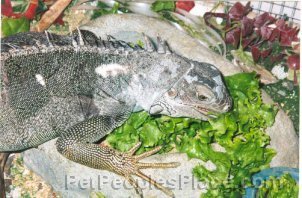 Fresh veggies are much healthier than commercial iguana food, and frozen thawed mice contain the right balance of nutrients that is difficult to reproduce in a "snake snack". Before you decide to try a commercial diet, research the product first. Internet forums, breeders, and vets are great resources to get opinions on proper diet. Variety in almost any animal’s diet is a sure way to provide the right nutrients, whether they are insectivores or herbivores. The only exception would be snakes. A diet of rodents is the most appropriate for most of the commonly kept snakes available in the pet trade. Any "treats", like trying to feed a snake chicken or pork, is likely to cause digestive upset and will not offer the snake any nutrients it could not get from a rodent. They have evolved to live on a diet of rodents, and therefore rodents are the perfect food for them. Something to consider while feeding your snake is the live vs. pre-killed debate. Feeding live rodents is very dangerous, and should only be done if the snake refuses to accept pre-killed food. Most snakes will learn to accept pre-killed food. Live food can easily injure you snake. Even while being constricted, a mouse or rat can manage to bite an eye or the neck, and cause life-threatening damage to a snake. Frozen rodents are also usually less than half the price of live. You can stock up and avoid a weekly trip to the pet store. Freezing also kills any harmful parasites the rodent may be carrying. Feeding pre-killed is the most responsible way to feed your snake. Just make sure any frozen feeders are completely thawed and at least room temperature before offering them to your snake.